All that leaf-printing and ironing didn't create the glorious piece I had in my mind's eye. I can't even blame the photograph; this is one piece of fabric that looks even worse in real life than in the picture! 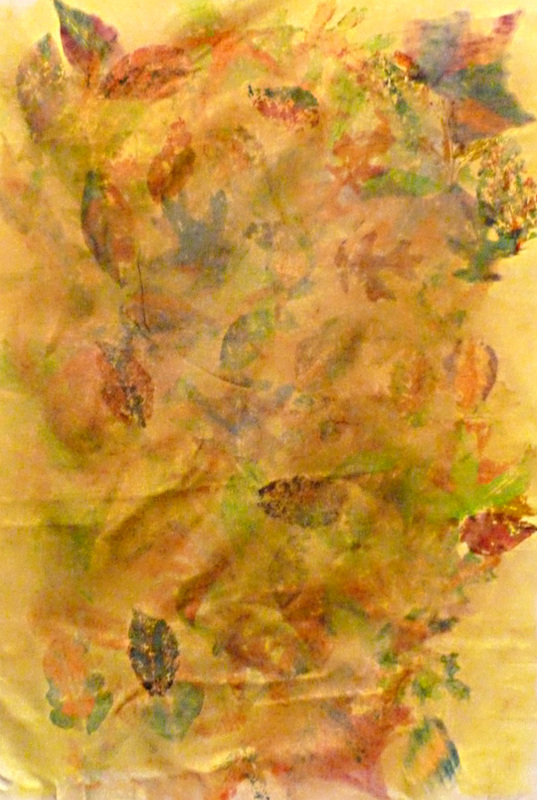 Vivian told me to stop, oh, 10 to 15 leaf-prints ago, and Vivian was right. Fortunately for morale, I've got another piece of polyester satin that was being used to test various techniques, and that came out great, and I've quilted and embroidered it to make a little wall piece. It should be a good size for putting over one of the places that really needs to be repainted. But first I've got to trim and bind it, and meanwhile it's been telling me that it wants gold thread embellishment. And pearls. For a small piece, it's extremely demanding. Those little bottles of transfer paints ran out really fast, so I ordered a complete set of transfer dyes in powdered form from Prochem (www.prochemicalanddye.com) [The insert link thingie is behaving oddly today]. 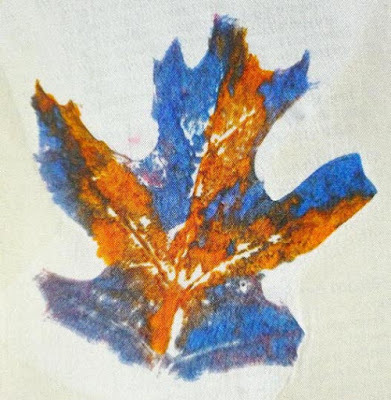 It may not be trivially obvious where they are; go down to "Dyes for Polyester, Nylon, &c", click on that, and then on "Pro Transperse Transfer Printing Dyes." I bought 2 oz. of each; if I'd realized how much painting on paper that will do, I'd probably have started out with the 1/2 oz. packages. You'll need something to thicken the mixed dyes if you want to do anything like stamping or screen printing or roller printing or monoprinting or... well, anything but watercolor effects. ProChem wants to sell you 3/4 lb of "Pro Thick F". I decided from the description that it was the same as Dharma's low viscosity sodium alginate for silk, which I have on hand, so I didn't invest in their recommended thickener (more about this below). They send directions for how to use the dyes, or you can download them from their website. They can be something of a PITA to mix up,as you're supposed to mix each color of dye into a half cup of boiling water, wait for that to cool down, then mix in the thickener. Mixing all 9 colors can take forever if you're using just one Pyrex mixing cup. I went over to the local thrift shop and bought 9 coffee mugs for $2.00. Problem solved. Now, about the thickener: if you're using Dharma's sodium alginate for silk and want a thick mixture for screening, do not - DO NOT - use the recommended measurements from Pro Chem. They tell you to mix seven and a half tablespoons of thickener into one cup of warm water. Since I wanted a medium-thick mixture for both screening and hand painting, I decided to mix it half-strength, drizzling 7 and 1/2 tablespoons of sodium alginate into two cups of water. I don't actually know how much I put in there. Somewhere in the stirring process, well before I'd added all 7 1/2 tbsp., the "thickener" turned into a ROCK. This was a mix you could bounce off the walls. It was a mix you could break windows with. Maybe these proportions work with ProChem Thick F, but you don't ever want to do it with straight sodium alginate. So I poured in extra water, and let it sit for a while, and stirred, and poured in extra water, etc., etc., and I don't know what the proportions were by the time I had something remotely liquidish. And that had to be diluted by half again when I actually mixed the dyes. I've still got a quart of semi-solid thickener sitting in the fridge which I will thin out next time I mix dyes. I mixed up half the quantity of dye recommended, so I had just 1/2 cup of (still rather thick) dye for each color. 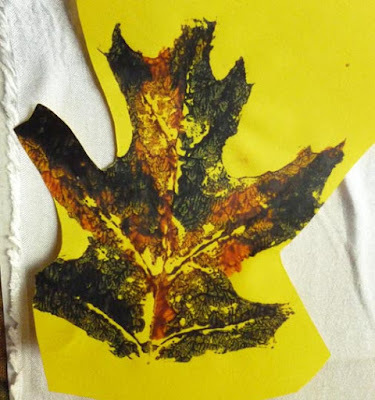 That was enough for Vivian and me to spend an entire day painting paper; then I spent weeks making those leaf transfer prints; then I just painted some solid sheets to use up the dyes; then I gave up trying to use up the dyes. There are still nine jars of liquid transfer dye in the workroom. Which, according to the instruction sheet, are probably too old to use now, but I'm going to test that before I throw it out. “I extend to you and the Afghan people my sincere apologies,” Obama wrote, according to a statement from Karzai’s office. Oh, yeah, did I mention that those Korans had been pulled from prison library shelves because the prisoners had expressed their deep reverence for their holy book by writing extremist messages on them? In related news, CBS headlined their story "Afghans protest peacefully over Quran burnings"...before casually mentioning that yesterday's riots left "seven people dead and dozens wounded." Because, you know, those peaceful protests are so dangerous. Okay, I made some of that up. But can you guess which part? The "free birth control" rule: With the exception of actual churches, all organizations - including Catholic charities and hospitals - must provide health insurance for their employees that covers free birth control and abortifacients (e.g., the "morning-after" pill. - My summary of the original regulation, which is long and hard to read; if you want, you can find it here. Huh? Unless free birth control pills are falling out of the sky, somebody's going to be paying for them. Obviously insurance companies are going to fold this cost into their premiums. "Okay, we have this plan, which costs X, plus Y if you want to cover birth control; or we have this plan, which costs X + Y, but guess what - birth control is covered free of charge!" The press is parsing objections to this plan as "wanting to deny women access to birth control." How stupid do they think we are? Women have access to birth control now, and plenty of organizations - including Planned Parenthood, which is ubiquitous - offer free exams and birth control for low-income women. I'm not Catholic. Even if I were Catholic, I probably wouldn't go along with the Church's stance on birth control. But that's not the point. It's not about Catholicism and one point of doctrine: it's about forcing people to violate their consciences. Jeff Jacoby of the Boston Globe puts it very clearly: "Accommodating sincere dissent is essential to democratic pluralism. Our legal and political institutions should go out of their way whenever possible to respect the demands of conscience. Obviously there are limits: Conscience cannot be allowed to excuse violence or fraud or abuse. But nothing about the Obama administration’s contraception-and-abortion agenda justifies its disregard for those who have profound religious, cultural, and constitutional objections to that agenda." A letter of protest originating at Notre Dame has now been signed by, among others, members of the Stanford Constitutional Law Center, the Department of Medicine at Columbia University, the Religious Freedom Project at Georgetown University, Princeton University, the University of San Diego, Brigham Young University, the Jewish Theological Seminary, Yeshiva University, the Southern Baptist Theological Seminary, Baylor University, Texas A&M University, the Translational Genomics Research Project, Stanford University, the University of Alabama, the University of Texas, the University of San Francisco, the University of South Carolina, Roanoke College, Houston Baptist University, Prison Fellowship Ministries, the Ethics and Public Policy Center, and the Becket Fund for Religious Liberty. They get that it's not about birth control, it's not about Catholicism, it's about the Constitutional protection of the free exercise of religion. For the government to force individuals and institutions to act in violation of their consciences is the most egregious violation of the freedom of religion cause that I can think of. Do you get it, or do I have to quote Pastor Niemoller at you? Better speak up before they start dismantling the second clause of the First Amendment - you know, the one about freedom of speech? It started innocently enough, with a packet of mix labeled "Tuscan Beer Bread." All I had to do was mix in a bottle of beer, pour it into a loaf pan, and bake for an hour. It turned out great. 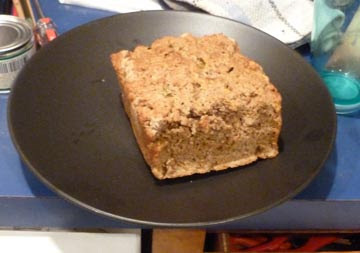 So I thought, "I bet I can do this without a $5.00 package of bread mix," looked up some beer bread recipes on the Internet, and had a go at making my own. It had the shape and consistency of a book. Now, I love books, but they're not so good for something you want to break apart and slather with butter. So, back to the Internet, looking for an explanation of why my bread wouldn't rise. Somewhere, somebody mentioned the advisability of using fresh baking powder, and I turned over my baking powder tin and looked at the expiration date. Hmm. "Best if used by 2006." Okay... I really haven't baked in a long time, have I? Got out of the habit when the Spawn were at an age where one or both of them needed to be ferried somewhere every 45 minutes. However, with one of them living in Round Rock and the other in New York, that's not much of an excuse any more, is it? And Steve really, really likes fresh-baked bread, and he'd love to have something with texture and flavor instead of the bland, puffy loaves that come out of the bread machine; we both would. So, back to the grocery store, and I tried again with some young and active baking soda. This time it worked a treat; here's a snap of what's left of the loaf. Now I've remembered how gratifying it used to be to make actual risen bread from scratch, kneading and letting it rise and kneading again... and there's a jar of yeast in the fridge, a jar of sourdough starter fermenting on the counter, and five-pound canisters of white and whole-wheat flour under the counter. And Steve is very, very happy. So, memo for next time: Read the label. Or, as we used to say in computerland: if all else fails, RTFM. Now that I'm over bronchitis, I am once again walking (slowly) around the neighborhood. [Memo to self: next time, don't wait a month before going to the doctor.] We've been having alternating rain and sun, and the leaves that are still slowly falling off the trees are decaying into interesting patterns. This has provided innocent amusement for both the neighbors and me. The neighbors get to observe me walking along and stopping every few steps to dive down and pluck something out of the gutter. If they didn't already know I was crazy, this probably cinched it. I don't think explaining "I'm collecting partially skeletonized leaves," would help much. Then I get to take my trophies home, press them in the telephone book (nice to know it's still good for something), take them out and slather paint on them, and make a print on a piece of scrap paper. You may notice that the paper around this print has been cut away in an apparently random fashion. This is one of the things I love about transfer dyes: I can snip away the worst drips and blots before committing to fabric. I'm working on a piece of fabric that's to be totally covered with leaf prints; will take a snapshot when it's done. I have too much stuff. Everybody I know has too much stuff. I've been filling up the trash can every Thursday (pickup is on Friday, so that's when I know how much space is left for assorted junk)and filling bags of potentially usable stuff for Goodwill. Like those little woven-wood baskets that mate and reproduce themselves when your back is turned, and the fancy electronic toy Steve bought me three years ago that I never actually learned how to use, and the perfectly good warm-weather clothes that I haven't worn once during the last two hot seasons so obviously there's something about them that doesn't work for me. Okay, Goodwill probably doesn't need the little baskets any more than I do, but let's pretend, shall we? There are about half a dozen of them still in my workroom, some holding a collection of stuff related to an ongoing project, but most serving as catch-alls for the stuff I find when picking up the workroom that I want to keep but don't, right now, want to figure out where it goes. Unfortunately I never wake up in the morning thinking, "Oh, what a perfect day to sort through every box on the workroom shelves to figure out where this lampworked bead and that cabochon belong!" So the Baskets Full of Miscellaneous continue to overflow. My only hope is that by giving away all the empty baskets I can force myself to clear the other ones because I no longer have any convenient place to throw all the small stuff that I don't know where to put it. Anyway. So this morning I loaded up the car trunk with sacks of stuff we don't really need and drove to the nearest Goodwill donation site and emptied the trunk. Then I went to Walmart and bought a bunch of stuff we do, arguably, need...and now the trunk is full of those sacks. I could probably make a case for this morning's activity. But the Disinterested Alien Observer who sits in the back of my mind thinks that this particular organic form's primary purpose is to move sacks of stuff from one location to another. And maybe it's right.